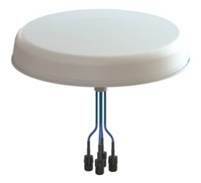 The CMQ69273P is an indoor broadband Low PIM 4-port MIMO omnidirectional ceiling mount antenna with each port operating over 698-960 /1710-2700 MHz. It is designed to provide pattern coverage that is optimized for indoor requirements. The individual antennas elements are designed to radiate a pattern that has been specifically shaped to provide optimal radiation within a coverage zone.